I want to convert all my Music Library From MP3 (some are WMA or M4A, but those can be handled manually if need be) to Ogg Vorbis, as I finally booted (in the shoe-sense) Windows from my Desktop. I've looked in the Repos and found Sound Converter and OggConvert, but Sound Converter loses all my Metadata and Ogg Converter can't batch. I've also tried mp32ogg on the commandline, but the Filenames it gives are just awful. Does Anyone know a batch MP3 to OGG Vorbis Converter that doesn't lose Metadata or mess up filenames? I'm using Ubuntu 9.04 and I'd prefer Free Software. P.S. I wouldn't mind FLAC either. Anything Open Source. It sounds like mp32ogg --lowercase --rename=??? may help you come a little bit closer. I have not tried this my self, so good luck. 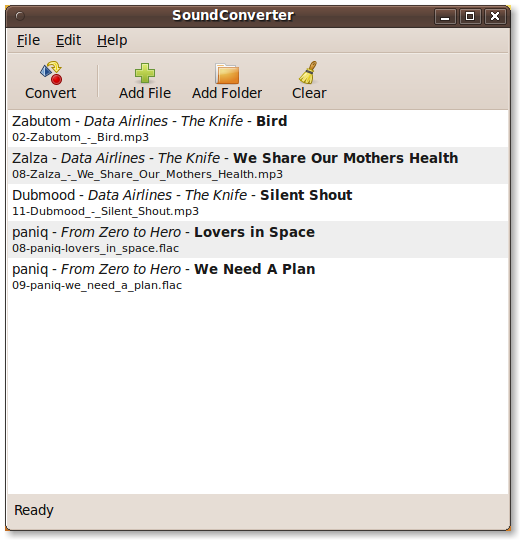 Ubuntu comes with SoundConverter which does exactly what you want. You can choose to keep or delete the original files. Look at Preferences and make sure they are what you want. Command line tool to write flac, ogg vorbis and mp3 id3v2 meta data?